When the British fleet of 19 ships, now under Graves's command, arrived back at the Chesapeake on the morning of September 5, they found 25 French ships at anchor behind Cape Henry. The remaining 3 ships of de Grasse's fleet had been detached to blockade the York and James Rivers farther up the bay, and many of the ships at anchor were missing officers, men, and boats. This meant that 24 of the French ships were able to cut their anchors, sail out of Chesapeake Bay, and form their own line of battle. By 1pm, the two fleets were roughly facing each other, but sailing on opposite tacks. 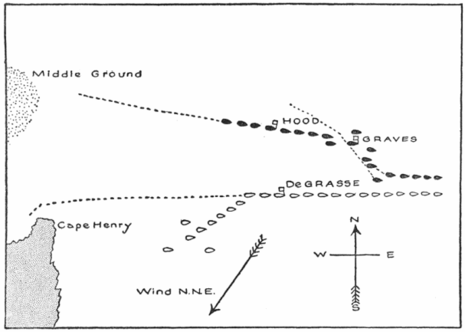 In order to engage, Graves then ordered his whole fleet to execute a 180-degree turn, so the nominal rear of his line became the van (the leading group of the line) for fighting purposes. It was after 4 p.m., over 6 hours since the two fleets had first sighted each other, by the time the British—who still had the weather gage, and therefore the initiative—were ready to open their attack. At this point, both fleets were sailing generally east, away from the bay. The two lines were approaching at an angle so that the leading ships of the vans of both lines were within range of each other, but the ships behind them were still attempting to close the gap. A shift in wind direction during the battle made it even harder for the ships in the rear to engage. Thus the ships in the van on both sides were engaged in heavy and continuous firing from the beginning of the action, while several of the ships in the rear never got into action at all. There was also confusion in the British fleet's maneuvers caused by apparently contradictory signals issued by Graves during the battle. Around 6:30 p.m., at dusk, firing ended. Graves gave a general signal to keep to windward so that the heads of the two fleets separated. By this time, the British ships in the van division that had borne the brunt of the battle were very badly damaged and unable to continue to fight effectively in any case (the first five ships in the British line sustained over half of all British casualties). Many of the British ships had been leaking badly and were in need of refitting even before the battle, and the French gunnery had been particularly destructive of the ships' rigging and masts. The actual battle ended on the evening of September 5, but for several days afterward the two fleets continued to maneuver within sight of each other, as ships on both sides carried out repairs. In the meantime, both fleets were sailing farther and farther away from Chesapeake Bay, their strategic objective. 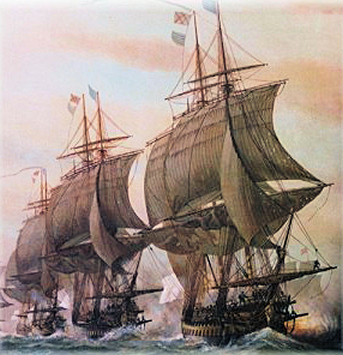 Finally, in the night of September 9 to September 10, de Grasse turned the French fleet round, hoping that the French squadron from Newport, Rhode Island under the Comte de Barras would by then have arrived in the Bay. When they arrived back at Cape Henry the following day, they found that de Barras had indeed arrived after his circuitous but carefully timed voyage, bringing their combined strength to 36 ships of the line. Thus Chesapeake Bay was indisputably under French control, and the artillery brought by de Barras was the key to the relatively short siege which followed at Yorktown. Although the actual naval battle was inconclusive, the Battle of the Chesapeake was a major strategic victory for the Franco-American alliance because of its consequences for the land campaign. The inconclusiveness was often blamed on the British Captains, who failed to bring the French to decisive action. Cornwallis was cut off from rescue or resupply, while the French were reinforced by the troops brought by de Grasse, and Washington's army converged from the north. This led to the siege of Yorktown, the surrender of Cornwallis' army, and the ultimate defeat of the British forces in America. In May 1781, Admiral Comte de Barras arrived in Newport, Rhode Island with the long-awaited news that a major French fleet would render assistance to the American cause in the late summer. That fleet, under the command of François Joseph Paul, Comte de Grasse, was en route to the West Indies and would later head to North America. De Barras, lacking sufficient strength to confront the British, sailed off for temporary refuge in Boston Harbor. In mid-August, Admiral de Grasse sent word to George Washington that the French fleet would sail for service in Chesapeake Bay and be available for joint operations until mid-October. He was unable to make a longer commitment because he had to get his ships to safety at the height of the hurricane season. On August 25, a number of British ships under the command of Admiral Sir Samuel Hood arrived in Chesapeake Bay. They searched for French ships and, finding none, sailed off to New York to join Admiral Thomas Graves' larger fleet. Graves took command of the combined force and sailed for the Chesapeake on August 31, arriving in the area on September 5. Meanwhile, Admiral de Grasse arrived at the mouth of Chesapeake Bay on August 28 with a fleet of 24 ships carrying 1,700 guns and 3,000 soldiers. The land forces were put ashore several days later and joined with the army of the Marquis de Lafayette. On September 5, Graves was astonished to find the French in possession of Chesapeake Bay. De Grasse realized that conducting naval operations within the bay's confines would be difficult and sailed into the Atlantic waters off the Virginia coast. Most authorities agree that the inept Graves should have struck as the French fleet proceeded in single file into open waters; he did not, which allowed them to form a battle line. From one perspective, the two-hour Battle of the Capes ended in a draw. The British sustained serious damage to six ships, one of which was later purposely destroyed, and suffered around 300 casualties. The French saw four ships significantly damaged, and sustained more than 200 casualties. Following the encounter and continuing for the next few days, the two fleets drifted south in sight of each other, but did not renew hostilities. From another perspective, despite failing to deliver a knockout blow, De Grasse succeeded in his prime assignment — to seal off the mouth of Chesapeake Bay and deny Cornwallis opportunities for reinforcement or evacuation. While Graves and de Grasse drifted down the Virginia coast, the smaller French fleet of Admiral de Barras arrived from Newport carrying Rochambeau’s supplies and cannon, and sailed uncontested into Chesapeake Bay. Graves’ critics cite his failure to dispatch seaworthy vessels back to the bay, arguing that the copper-sheathed bottoms of the British ships gave them a decided edge in speed and that they would likely have won a race back to the Chesapeake. On September 10, Graves broke contact with the French and headed his battered fleet back to New York for repairs, leaving the French in total control of the Chesapeake and probably sealing Cornwallis's fate. De Grasse then set about the task of transporting Washington's and Rochambeau's forces from the northern Bay area to Williamsburg.